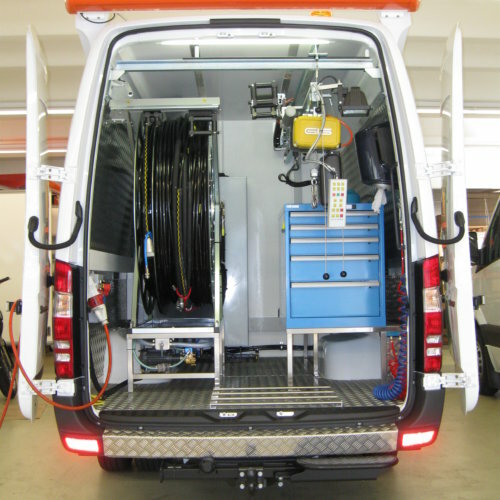 The multi-function system from KA-TE is installed in a Mercedes Sprinter with an overall weight of 5.0 tonnes. A powerful and efficient vehicle that gives you the flexibility and independence you need on site. Electricity, water, resins and all other materials are on board and ready for use. Operators can enjoy ideal working conditions regardless of the weather thanks to auxiliary heating and air conditioning. Monitor, keypad, robot controls, intercom system, monitoring camera and all the recording equipment required for documentation are arranged ergonomically and expediently in the control room. 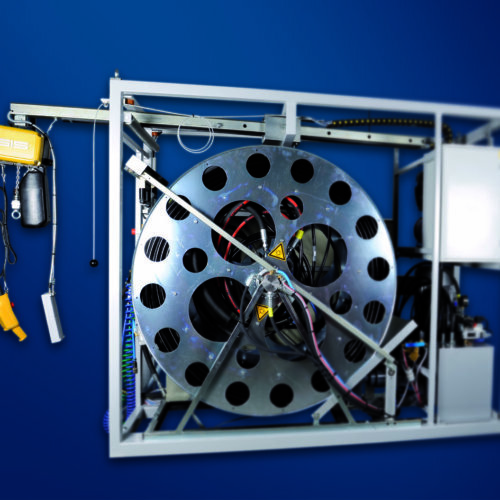 The electronically controlled cable/hose drum with a 90 m robot cable and compressor are integrated in the control room. A crane equipped with spotlights and a cable winch with distance measurement are also included in the basic equipment. We also offer a tandem trailer for the system vehicle containing a generator of the latest generation, storage compartments for materials and accessories and sinks for cleaning. Simply the best in on-site flexibility. The Sprinter 5t from Mercedes is the ideal vehicle for our systems. It is characterised by reliability and a long service life. We equip the Sprinter with everything you need for on-site rehabilitation work. The robot control room is located at the rear. Its installations include a cable drum with robots, a retractable crane system, an air and water system, a 250 l water tank and a powerful hydraulic aggregate. The remote-controlled robots are operated from the control room. A screen and keypad enable precise remote control of the robots. Auxiliary heating and air conditioning ensure comfortable working conditions whatever the weather. A refrigerator for the operator’s lunch box is included in the standard equipment. We will be pleased to take customer preferences into account and design the superstructure to suit your requirements. The AS-20KVA trailer is equipped with a powerful generator. It supplies the KA-TE system with the power it needs. In fact, the 20 kVA produced by the generator are more than enough to operate our system all day long. The trailer is also ideal for storing the shutterings of the KA-TE shuttering system. A thermal cabinet enables the operator to cool epoxy resins in summer and heat them up in winter to guarantee ideal filling conditions. Mixing the two components is made easy by an integrated mixer. Operators working on site can clean their hands in the built-in sink. 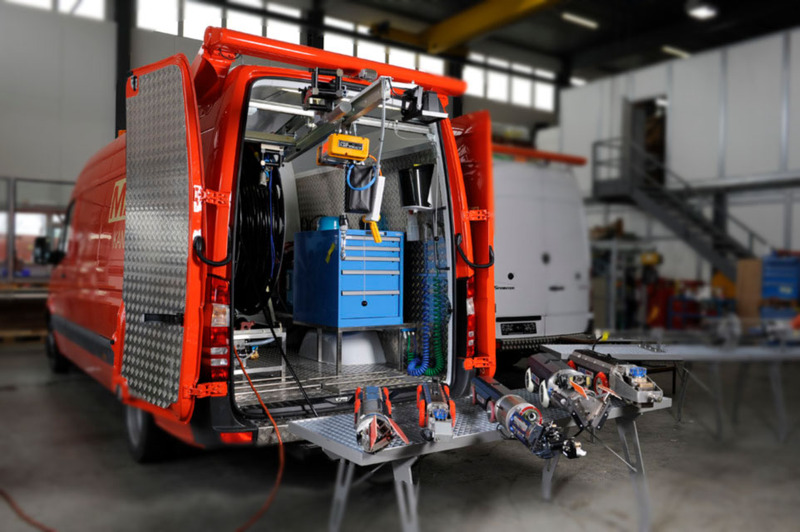 The COMPACT system is equipped with a robot cable and an 85-metre hydraulic hose package and offers the full functionality of the proven Sprinter system. 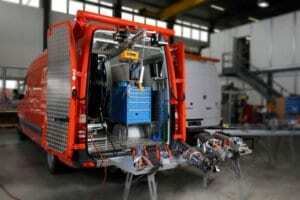 The robots are operated via a mobile control console with an integrated keypad that is connected to a 15″ flat-screen monitor. The COMPACT system houses the hydraulic aggregate, cable drum, compressor, water tank (250 litres), water pump, electric system and an extendible pivoting crane in an inherently stable steel frame. The frame is equipped with runners for transport by forklift truck. The system can also be transported to the operating site by crane and is immediately ready for use. 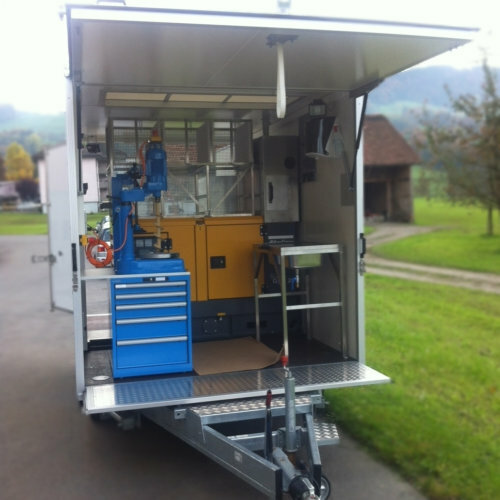 It is also possible to install the COMPACT system in any suitable vehicle for on-site use. Installation is very simple: the system is bolted to the vehicle floor and connected to the control console via a cable. Special vehicle registration is not required. This system is therefore particularly suitable for international operations.